Late payments continues to be an issue, but information is scarce. Time to look at some numbers from the latest ACE Benchmarking Report, says ACE chief executive Nelson Ogunshakin. ACE through Infrastructure Intelligence, other media and groups has long campaigned and supported industry in trying to address the issue of late payments. Late payments are economically inefficient and can have a significant effect on cash flow and the viability of a business. Changing such behaviour, however, is difficult and data surrounding the exact nature of the problem scarce. For this reason two years ago ACE introduced a comprehensive set of questions regarding late payment within its benchmarking exercise, from which I am are now happy to report the findings. Let’s start by looking simply at companies’ debtor days. It was revealed that SME participants were on average equivalent to 81.5 days’ sales; larger UK companies carry a similar level of debtors, equivalent to 79.5 days’ sales. Such numbers are significantly in excess of the 30 day target. The numbers above, however, do not differentiate between private and public sector debtors. Whilst not all companies could provide data, when this is accounted for it is revealed that private sector clients take 10 days longer to arrange payment, than the public sector. The question is, how widespread is the practice of late payments? The sample data revealed that a quarter of UK companies received 50% or more of their revenue outside the contract terms. Such a significant amount of payments being outside contracts have knock-on effects for company time and costs. The data received revealed that SME firms’ directors/partners spend 4.6% of their time settling late payment disputes. For large firms the time spent was 5.1%. Looking beyond directors/partners, large firms’ other staff spent 5% of their time trying to settle late payment disputes whilst other SME staff spent 8.4% of their time undertaking these duties. This demonstrates the significant time that can be spent on such activity and why efforts to improve payment times would bear savings not only for companies but also for clients. Companies were asked to indicate how long after the contractual due date they would send a pre-action letter. Answers ranged from 7 days to 210 days. This is obviously a significant range and will affect a company’s ability to settle disputes. "SME firms’ directors/partners spend 4.6% of their time settling late payment disputes. For large firms the time spent was 5.1%." It was clear from the data that larger UK firms typically are more prompt in sending out a pre-action letter. The median for large companies was 45 days but 60 days for the benchmarking SME firms. Some companies, however, did report waiting over 100 days past the due date before action was taken which seems to be excessively lenient. 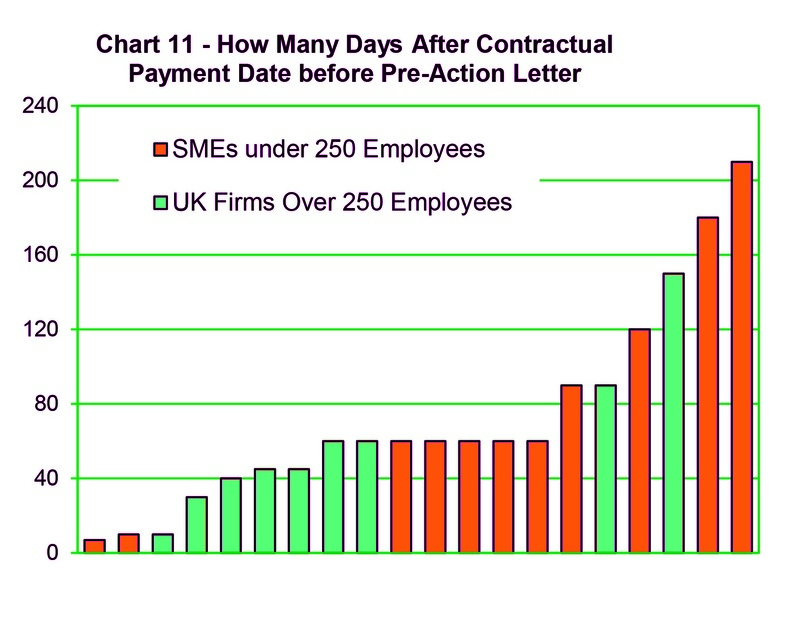 Looking beyond a pre-action letter, large companies reported that legal action would be undertaken after 95 days, with SMEs indicating a similar figure of 100 days. The figures above make for worrying reading, and show that action is needed to try and address the issue of late payments. The collation of the data above is only the start, ACE intends to continue to develop and extend the companies in this sample to improve the wider understanding of the issue. To help ACE achieve this I urge companies to take part. There is, however, a much larger picture to be aware of. Payments form a part of a much wider procurement process which is in need of greater understanding by all parties. Change needs to occur on multiple fronts across the short medium and long term. Cultural change will always be a long process, and where industry can make short term improvements these should definitely be sought. The problem, however, is much greater than simple contract terms. ACE will therefore continue to engage with all parties from government, clients and companies all the way down to the very bottom of the supply chain to help move the debate forward with the aim of improving conditions for industry and clients. · In the 2014 report average overall profit margins improved for UK firms to 4.9% (previously 4.1%) whereas it declined for EU firms to 6.3% (previously 6.8%). · Companies overall are forecasting a profit margin improvement of 1.1 percentage points next year. · SME firms achieved an average profit margin 9.0 percentage points higher than large firms. · Average year end debtors days for EU firms was equivalent to 100 days which was higher than that of larger UK firms at 80 days and SME firms at 82 days. · Fee earners’ staff costs accounted for 62% of revenue in UK large firms, for SMEs the percentage was 57% and for European firms it was 59%. · On average UK companies spent 4.8% of directors/partners time settling late payment disputes. · On average large firms generate £1.45 of revenue per £ of staff cost, whereas SMEs generated £1.58. · Professional indemnity insurance costs for larger companies on average are 1.3% of their revenue or £800 per fee earner, SMEs paid 2.2% or £1,500 per fee earner.